The recent broadcast by the BBC of a 1961 studio recording of Schoenberg's "A Survivor From Warsaw" conducted by Rudolf Schwarz reminded people of this musician who was Chief Conductor of the BBC Symphony Orchestra at the end of the 1950s. Born in Mahler's Vienna in the early years of the 20th century, Schwarz made his debut in 1924 in Dusseldorf but, unlike many fellow Jewish artists, remained in Europe under the Nazis, ending up a prisoner in Belsen concentration camp from 1943. Liberated in 1945, he found his way to England where he took British citizenship. Knowing all this makes his "Survivor From Warsaw" performance that much more powerful. 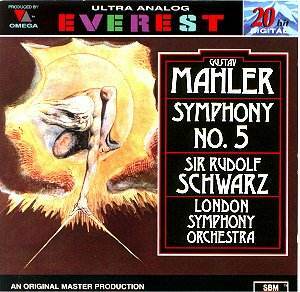 He made few commercial recordings, but this Mahler Fifth for Everest dating from 1959 is worth seeking out. The solo trumpet figure, which will haunt the first movement is grim and determined under Schwarz and ushers in a steady funeral march with weight and dignity. I also liked the way the elegiac second theme dovetails out of the march. Then, at the point marked "Suddenly faster. Passionate. Wild" (a quasi-trio section), Schwarz resists the temptation to hit the accelerator so what emerges is stoic rather than frantic and when the main material returns there is bitterness as the tread strides out with great character. The second return of the "trio" finds Schwarz master of contrast with a more measured tempo. The conclusion of the movement sees the music rise to a climax marked "Klagende" ("Lamenting") after which it descends into a pit of despair and here Schwarz imparts real dread. His second movement is rugged and measured so we do hear everything clearly which is not always the case. For example, I like the chattering woodwind when the storm subsides which engineers can rob of its weird power. The theme that then emerges is from the first movement and Schwarz makes us aware of this so there's no doubt he knows this music from the inside. After another stormy outburst, the music withdraws into what Floros called "the monody of the lamenting cellos" and Schwarz conducts it without artifice but not so withdrawn that it sounds detached. Towards the end of the movement the music propels towards material that will bring the whole symphony to triumphant conclusion. Under Schwarz this is underplayed slightly so that the final appearance at the end of the last movement is not robbed of its resolution. Another example of Schwarz's inner knowledge. Performances of the third movement that most convince are ones that give the episodes time to breathe and Mahler himself knew this only too well. There should be a complete change of mood with the composer telling us there is a different way of looking at the world. Under Schwarz there is lift to the opening and a dance-like element to the rest which, when added to some old-world grace, makes a really idiomatic performance. The horn obbligato was probably played by a young Barry Tuckwell who gives a lovely account on this recording. Later, when Mahler has shuffled his material, Schwarz makes a kaleidoscopic picture of colour, rhythm and gayety. It's in the Adagietto fourth movement Adagietto that Schwarz's recording confirms its special nature. Like Bruno Walter, and unlike any other conductor who has recorded the complete work, Schwarz treats it to the nearest overall timing that coincides with what is believed to be Mahler's own: a delicate "song-without-words" that therefore fits its recapitulation in the final movement which is itself given a spacious account but still with the right amount of forward momentum. Others may deliver more energy and virtuosity, but I think Schwarz's approach pays great dividends since it contrasts better with the first movement which it is meant to counterbalance. There are drawbacks to this recording. The 1959 LSO's playing has some rough patches, especially ensemble. The sound recording also shows its age, in spite of the fact that it employed a recording system unique in its day. But it's a well-balanced stereo picture and only the hi-fi enthusiasts would object.